Junior High School, Senior High School : Toyo Eiwa Jogakuin. The school day begins with a chapel service and ends with class prayer. These traditions have been maintained since Toyo Eiwa was founded in 1884. All students take a weekly Bible class, and YWCA activities are conducted on a regular basis. In recognizing God's unconditional love, students develop the uniqueness and dignity of their own personality, and respect for life around them. A strong spirit of service to others is fostered throughout their student lives. First-year students participate in "Diakonia," a course of activities designed to raise their awareness of people with disabilities. They learn Braille, sign language, and how to operate a wheelchair, among other skills. The course helps them to understand the difficulties of people with disabilities, and so become more compassionate and helpful to other members of society. We have a reputation for high-quality English education, supported by small-group English classes, and classes taught by native English speakers. We also have an English room used by many of our extracurricular English courses. First-year junior high school students perform Christmas plays in English, and each grade in the junior high school prepares for English speech contests or recitals. In the senior high school, students choose from a wide range of elective courses, including advanced mathematics and science, according to their individual interests, concerns and future goals. Musical education is a continuing tradition at Toyo Eiwa. 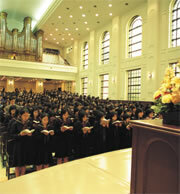 Our main chapel offers many opportunities to sing in the choir, play instruments and perform before an audience. The junior high school chorus contest, piano festival and handbell festival are some of the highlights of the school musical year. Particularly noteworthy is the long history of the extracurricular piano department,established in 1886. Club activities are compulsory for all students from the first year of junior high school to the second year of senior high school. Each student belongs to a single club and participates in club activities at least once a week. Students can also be involved in student-body activities, such as orchestra and other special clubs. Through these extracurricular activities, students develop qualities such as initiative, cooperation, responsibility, and creativity. The annual school festival is held to showcase these activities and has become a highly regarded event. The school owns a newly renovated campsite by the shore of beautiful Lake Nojiri in Nagano Prefecture. Various summer programs are held each year: A summer camp for the second-year junior high school students; a camp for third-year junior to third-year senior students; a leadership development camp; and other programs. Qualities such as responsibility, creative ingenuity, service and patience are fostered in these outdoor education programs. Each year about thirty students from third-year junior high school to second-year senior high school participate in a language training course in Canada. This course consists of a two-week language training program at Mount Allison University while experiencing dormitory life, and a one-week homestay on Prince Edward Island. Our former principal, Canadian missionary Miss F. G. Hamilton, who worked at Toyo Eiwa for twenty-five years, was a graduate of Mount Allison University, so we are very glad our students are able to spend time at her alma mater. Prince Edward Island is the location for the famous novel Anne of Green Gables. The first Japanese translator of this popular story was one of our alumnae. We also offer a spring language excursion at Shattuck-St.Mary's School in Minnesota, U.S.A. About twenty applicants from among first- and second-year senior high school students participate in this program. They join mainstream classes with other international and American students. Students who want to study abroad for a year are allowed to go without suspending their studies at our school, and every year several students study abroad under this system. In addition, from 2014 approximately ten students study at our partner schools in the U.S.A., Canada and Australia for three months. A few students also have the opportunity to represent Toyo Eiwa on the Bangladesh tour arranged every year by ACEF (the Asia Christian Education Fund). Other students participate through donations. Junior and senior high school students are able to deepen their international awareness through engaging and informative talks given in the chapel by international visitors who have served in medical care, welfare work, or as international volunteers in other fields. We also welcome students from abroad every year, with several foreign students joining our classes for periods of three weeks to a year.